This book offers new definitions of how failures can be characterized, and how those new definitions can be used to develop metrics that will quantify how effective a Design for Reliability (DFR) process is in (1) identifying failure modes and (2) mitigating their root failure causes. Reliability growth can only occur in the presence of both elements. Historically, the reliability growth process has been thought of, and treated as, a reactive approach to growing reliability based on failures “discovered” during testing or, most unfortunately, once a system/product has been delivered to a customer. As a result, many reliability growth models are predicated on starting the reliability growth process at test time “zero,” with some initial level of reliability (usually in the context of a time-based measure such as Mean Time Between Failure (MTBF)). Time “zero” represents the start of testing, and the initial reliability of the test item is based on its inherent design. The problem with this approach, still predominant today, is that it ignores opportunities to grow reliability during the design of a system or product, i.e., opportunities to go into reliability growth testing with a higher initial inherent reliability at time zero. 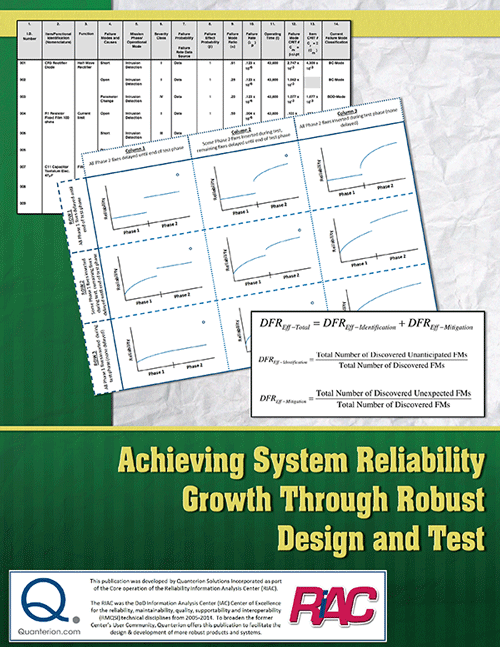 In addition to the traditional approaches to reliability growth during test, this book explores the activities and opportunities that can be leveraged to promote and achieve reliability growth during the design phase of the overall system life cycle. The ability to do so as part of an integrated, proactive design environment has significant implications for developing and delivering reliable items quickly, on time and within budget.